It’s the most wonderful time of the year…….Can you believe that December is upon us already? I swear this year flew by in the blink of an eye right before me. I enjoy December a lot because it means food, family and most of all FASHION. This is the one time of year to bring out the faux fur, velvet, and sequins for those holiday parties and NYE events. One of the hottest colors this season is EMERALD GREEN. Now when I say emerald green, I don’t want you thinking everyone is walking around looking like the cast for the WIZ lol. I personally think emerald green works well with any skin tone and matches a whole bunch of different colors when it comes to styling. Emerald green also happens to represent the universe, nature, and life, And of course, it’s my birthstone. So let us get into these looks below. The first dress is from Xehear Curvy. 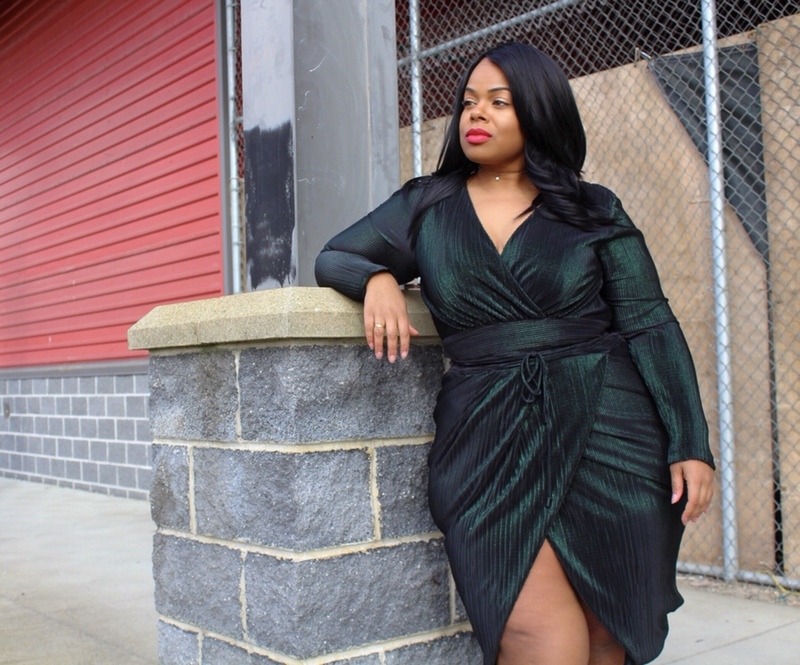 Xehear sells a full line of outfits and styles for straight and plus size women. I love that the brand is very diverse when it comes to sizing, and wants all women to look and feel good. The Maya Floral Sheath dress is perfect for those office parties or parties that don’t require to much. I love that the dress accentuates your curves but also keeps the look very flawless. The black flower detail also gives it that feminine touch of elegance. The second dress is from Windors. 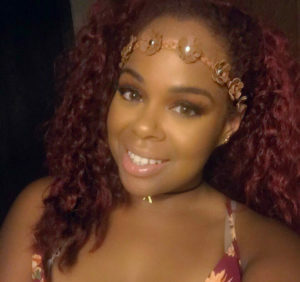 Windsor just introduced there new plus size section a few months ago. I really love that Windsor now offers more sizes so everyone can indulge in the beautiful clothing they sell. The dress I am wearing is the Emerald Twisted Body Con dress. This dress is a little more form fitting and may be better for a night with the girls or a NYE party. The green really stands out and has a hint of silver glitters for a sparkly effect. I love that the dress is super lightweight and the V-cut detail shows just enough to not give away all my secrets lol. Last but not least was a lovely dress by Rachel Roy which I got from Gwynnie Bee. 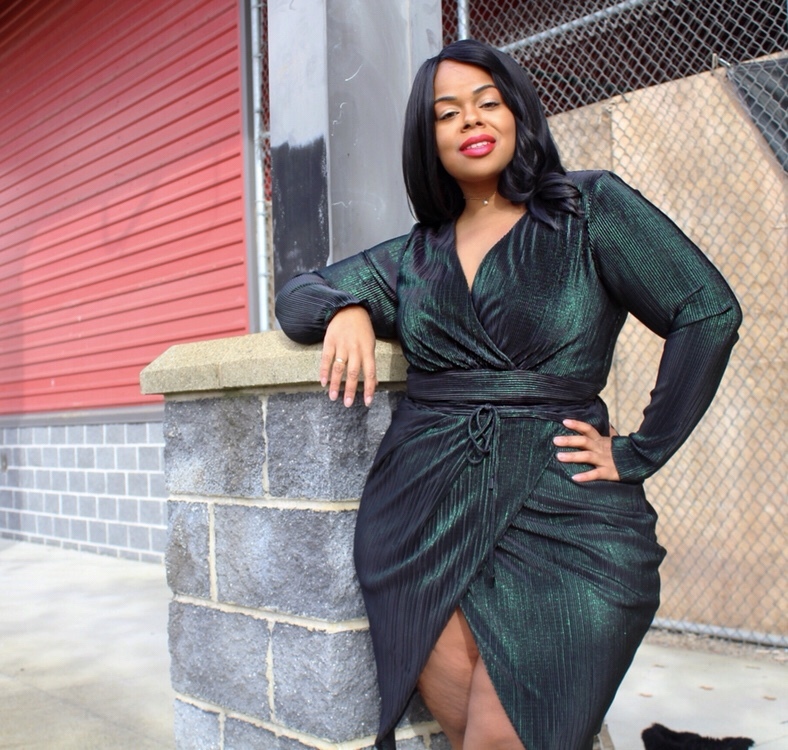 Gwynnie Bee is an online subscription-based clothing rental service for women sizes 10-32. Members pay a flat monthly subscription fee and are able to rent a collection of clothing to rent and return. The Ribbed Knit Faux wrap dress made me fall in love the moment I saw it. I just knew I had to have it and add it to my green collection. I love that the dress looks black in color but has a hint of the glittery emerald green in the material. This dress is perfect when you want to be the show stopper and really turn some heads. So what do you y’all think of the Emerald green trend? If you don’t have anything emerald green then now is the best time to go and stalk up. I think Emerald will always be a timeless color in my eyes. As always thanks for stopping by and Owl see ya soon.